In June 2011, I began a weight loss journey that’s had it’s ups and downs (but far from my yo-yo dieting days of the past). Starting at a 287 pounds (sadly, only a ‘lil more than 30 pounds over my high school graduation weight), I knew there were changes to be made. So, I met up with the Corporate Dietitian at a “10 in 10” class, aiming to lose 10 pounds in 10 weeks. That was in June 2011. In the 10 weeks, I changed my outlook on food and dropped about 16 pounds. I wasn’t dedicated to exercise, but I was dedicated to eating healthy. In the months that followed, I maintained the loss. After seeing a photo of me at my cousin’s wedding, I knew that it was time to get back to business and I started a monthly 1:1 check in process. I have officially lost 100 pounds! If you want to be technical, 101.6 pounds. And I want to keep going, not to meet some societal standard but because I want to keep improving my health and tone my body (I am hiding some ferocious skin flab). And I am not afraid to show you my official weigh-in, broken toe and all (oh, you missed that? I broke my toe in the Half and ran around on it the last 7 weeks without knowing, oops). Yeah, I know 185.4 is still a bit of a weight, but I continue to work and find meaning in every day, something I am not totally sure I was able to do 100 pounds ago. Excuse me, 101.6 pounds ago. I can get out of bed, run 3 miles, and not feel like death. I ran 13.1, who am I kidding? I am a new me, and I am so glad that I am doing this not only for me but for my ‘lil Burghers, my babies who need their Mama (and Daddy!) in their lives, being the best we can be. Some days I do not see much difference, but in my heart of hearts, I know this is a new me. Thank you all for your constant encouragement and love. Can’t wait to tell you again that another goal bites the dust. Now, where’s my next tattoo, Billy Hill? 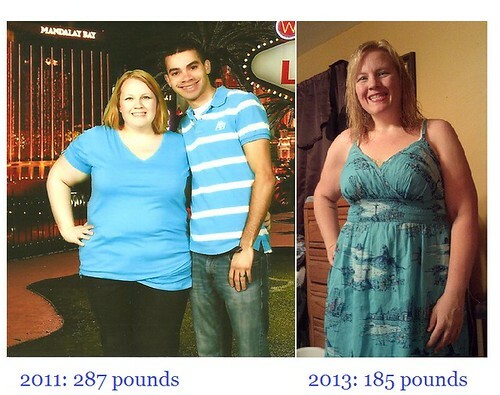 This entry was posted in Becky and tagged 100 pounds lost, weight loss, weight loss journey. Bookmark the permalink. Congrats! That is so stinking awesome! It sounds like you feel much healthier now and that’s what matters most. Proud of you! Incredible Becky, Just incredible! You have every reason to be proud as hell! CONGRATULATIONS!!!! That is so awesome, and you are such an inspiration! I’m so proud of you, and you should be proud of yourself, you are amazing!!! !